Best Choice Symbol PowerPoint Templates And PowerPoint Themes 1012-Create stunning Microsoft office PPT Presentations with our professional templates containing a graphic of golden tick mark with the phrase BEST CHOICE. These signifies elite, excellent, exceptional, exclusive, exquisite, fine, first-class, hand-picked, nice, popular, and precious. Use this PowerPoint Template to award someone special with this trophy for his or her work. Our PPT images are so ideally designed that it reveals the very basis of our PPT template are an effective tool to make your clients understand.-Best Choice Symbol PowerPoint Templates And PowerPoint Themes 1012-This PowerPoint template can be used for presentations relating to-"Best choice award, success, marketing, symbol, business, finance" Find favour with the audience for your ideas. Our Best Choice Symbol PowerPoint Templates And PowerPoint Themes 1012 will extract approval. Enter any deal with our Best Choice Symbol PowerPoint Templates And PowerPoint Themes 1012. Your ideas will sign on the dotted line. 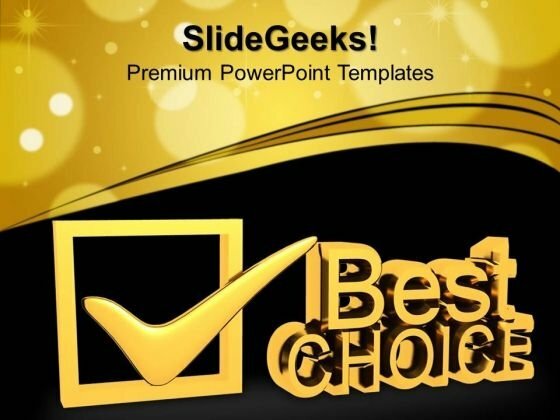 Create dynamic Microsoft office PPT Presentations with our professional templates containing a graphic of Best Choice with check mark award. This image represents the concept achievement and award ceremony. It is a useful captivating tool concieved to enable you to define your message in your Business and Marketing PPT presentations. Our PPT images are so perfectly designed that it reveals the very basis of our PPT template to make your clients understand. Convincing an audience can be demanding. Assert your credibilitywith our Best Choice With Check Mark Award PowerPoint Templates And PowerPoint Themes 1012. 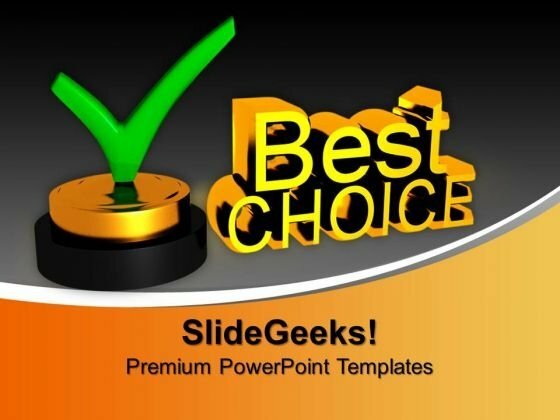 Recieve adulatory feedback with our Best Choice With Check Mark Award PowerPoint Templates And PowerPoint Themes 1012. The audience will give an enthusiastic response.